Indian skipper Rohit Sharma must be really happy after winning 4th T20 against Asian Lions held at R.Premadasa Stadium, Colombo. This Victor is special for Indian side as they are playing with a young side in their squad and also Men in Blue made it even the loss of opening T-20 match. This wholeT20 Tri series hosted by Sri Lanka to celebrate their 70th Independence Day against imperialism. With Virat and Dhoni not in the side, the new young Indian team has a huge pressure on them to prove their efficacy. During the opening match when India lost against lions it made everyone to miss ours in form batsman Kohli. Nevertheless, win against Bangladesh boosted Sharma’s led team confidence and consecutively they won against the host. Sri Lanka side under its captain Perera started off with style but recently lost against Bangladesh during the last match halted their Victor Chariot a bit. This loss of Asian lion reflected in the 4th T20 against India. India winning the toss opted to bowl after analyzing and predicting weather as well pitch condition. Sri Lankan batsman opener batsman Kusal Mendis scored a remarkable 4th fifty off 31 delivery hitting three boundaries and three sixes. With quick fall of two wickets, Sri Lanka made their 50 landmarks at 5.1 over with run rate of 10 runs per over. During the power play between 1 to 6 over they scored 53 runs at 2wickets. The partnership between Mendis and Tharanga of 50 runs off 37 balls helped Lanka to reach 105 runs on the scoreboard in 10.5 overs. During this time it seemed like host country will reach 200 runs mark with ease but it was Shardul Thakur tremendous show with his ball by fetching 4 crucial wickets and restricted whole Lanka team at the score of 152 runs. Last ten over for Lankan team proved fatal for them. From Indian side Skipper, Rohit Sharma and opener Dhawan went to pavilion early failing to provide impetus to the batting side. Men in Blue reached 50 runs at 6 over losing their two wickets of their openers. After that, they reached 101 runs at 11.4 over losing 4 top order batsman. 5th wicket partnership between M Pandey and Dinesh Karthik of 50 runs off 38 balls where former contributed 26 runs and later with 24 runs. The crucial partnership between these two batsmen helped India to successfully chase the run of 152 runs. India chased target at 17.4 over with six wickets in hand which remained quite difficult at one point of the time when Indians lost their top order batsman. 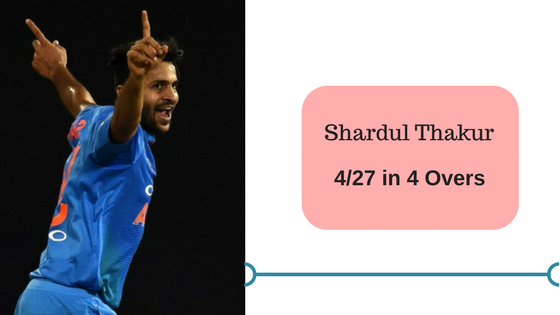 Shardul Thakur honored with Man of the Match trophy by fetching four wickets giving 27 runs off 24 balls.His bowling made a huge impact on Lankan side who seemed to have a great start by accelerating the runs at 10 runs per over. Crix11.com already predicted Indian team win and also pitch condition how it will change its course which proved right during 4th T-20. For more updates on Tri series stay updated with prediction section of crix11.com prior to the matches.